On this date in 1945, as Adolf Hitler celebrated his 56th birthday within a Red Army cordon, one of the Second World War’s more tear-jerking little crimes against humanity happened in Hamburg. Bullenhuser Damm — still to be found today — was a former Hamburg school which fell out of use as World War II progressed, owing to the devastation Allied bombings wrought on the surrounding area. The school itself sustained little damage, however, which eventually facilitated its appropriation as a satellite building for the nearby Neuengamme concentration camp. Over at Neuengamme, the SS doctor Kurt Heissmeyer had been conducting a litany of horror medical experiments on 20 Jewish children — mostly from Poland — culled from the concentration camps, seeking medical evidence for Nazi racial theories further to a cushy professorship. But as April 1945 was obviously endgame for the Third Reich, thoughts naturally turned to disposing of evidence of indictable offenses. 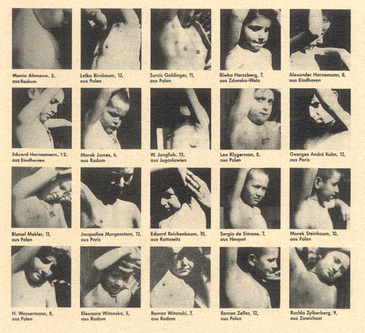 Photos of the eventual Bullenhuser Damm victims showing their surgical scars after Heissmeyer injected them with tuberculosis. Bullenhuser Damm was just the place for disposal. On April 20, the 20 kids were loaded up on trucks with their four adult caretakers — two French, two Dutch — plus six Soviet prisoners of war. In the next room, the 10 adults were being hanged. The other 19 children were disposed of in like manner, and then all 30 corpses cremated overnight … just in time for what must have been a much-needed 5 a.m. coffee. After the war, the facility went back to use as an actual (creepy!) school, but it was eventually renamed Janusz Korczak School, for a Polish-Jewish educator gassed with his young charges at Treblinka. There’s a permanent exhibition (German) at the site, as well as a memorial rose garden with a variety of plaques commemorating the victims of Bullenhuser Damm. Trzebinski’s take on his conduct this horrible night might have been good enough for his conscience, but it didn’t pass muster with his judges: he was hanged on a war crimes rap prominently including Bullenhuser Damm on October 8, 1946. Kurt Heissmeyer, however, avoided detection until 1959 and only received a long prison sentence in 1966, shortly before his death. 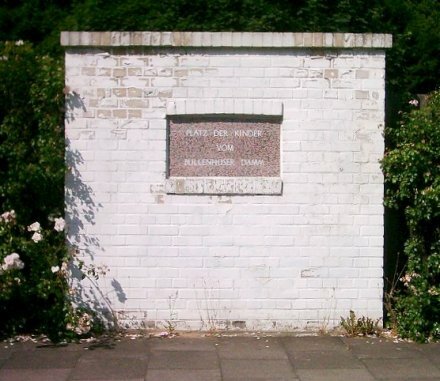 On the night of April 21, 1945 (possibly verging into April 22), 12 women political prisoners were hanged at Hamburg’s Neuengamme concentration camp. This forced labor camp had its own nasty history during the war, including medical experiments on children that would get the camp doctor hanged after the war. Those unfortunates had just been disposed of the day before. It was in the spirit of disposing that Neuengamme on April 21 received 71 political prisoners from the Fühlsbüttel prison/satellite camp. This site, one of the very first concentration camps in Germany, was being emptied out (as Neuengamme also soon would be) with the approach of Allied forces from the west: many Fühlsbüttel prisoners were released outright, while several hundred were sent on a death march to another camp. These special 71, who weren’t especially major antifascists and hadn’t been convicted of anything, thought their transfer to Neuengamme was just a halfway house to their own release — whether directly by the Germans, or via the imminent arrival of Germany’s foes. They were in for an unpleasant surprise: although Nazi Germany was going down, there were elements within it still looking to cripple the Left of whatever would emerge postwar. These 71 people — 58 men and 13 women — were communists, or White Rose activists, or other ideological foes whom the camp bureaucracy had tagged as “non-transferrable” elements. 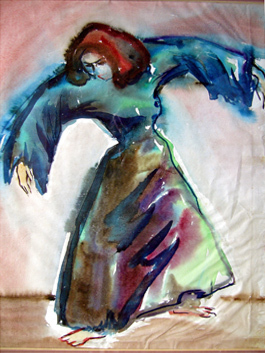 Annemarie Ladewig, a young artist who’d been booted from the academy due to a partial Jewish ancestry, painted this watercolor of a dancer. (More.) Ladewig’s brother and father were among the 58 male political prisoners killed at Neuengamme over the next few days. They were eliminated over the period from April 21 through April 24.